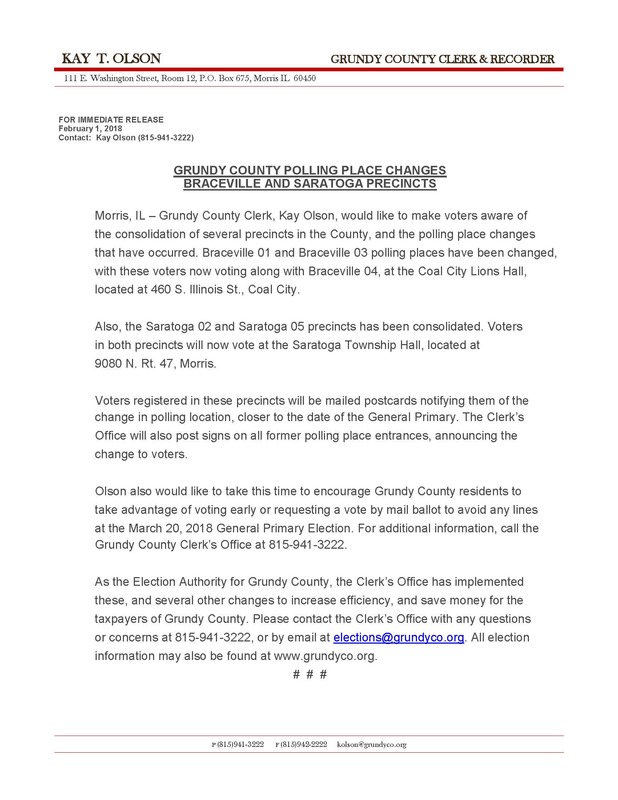 The April meeting of the County Board Members of Grundy County, Illinois will be held at the Grundy County Administration Center, 1320 Union Street in Morris on Tuesday, the 9th day of April A.D. 2019 at 6:00 P.M. for the purpose of Auditing County Claims and the Transaction of any other business that may properly come before the meeting. All bills of claims against the County must be filed at least seven (7) days prior to the meeting to insure notice of the Board at the meeting. 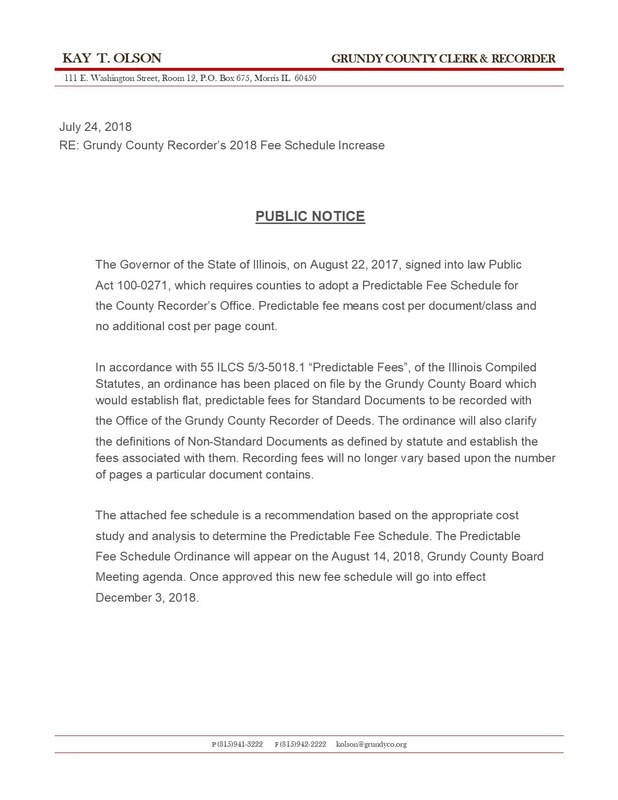 All interested persons are hereby notified of a hearing on the proposed budgets and appropriation ordinance for the fiscal year beginning December 1, 2018 and ending November 30, 2019 for the County of Grundy, Illinois. The hearing will be held at 5:45 p.m. on Tuesday, November 13, 2018 at the Grundy County Administration Center, 1320 Union Street, Morris, Illinois. The tentative budgets and appropriation ordinance will be available at the Grundy County Clerk’s office, 111 East Washington Street, Room 12, Courthouse, Morris, Illinois, during its normal business hours. All interested persons are hereby notified of a hearing on the proposed amended budget and appropriation ordinance for the fiscal year beginning December 1, 2017 and ending November 30, 2018 for the County of Grundy, Illinois. The hearing will be held at 5:30 p.m. on Tuesday, November 13, 2018 at the Grundy County Administration Center, 1320 Union St., Morris, Illinois. All interested persons are hereby notified that the Tentative Budget and Appropriation Ordinance for the fiscal year beginning December 1, 2018 and ending November 30, 2019, of the County of Grundy, Illinois, is available for public inspection. The Tentative Budget and Appropriation Ordinance and documentation necessary to support the Tentative Budget and Appropriation Ordinance are available at the office of the Grundy County Clerk, 111 East Washington Street, Room 12, Morris, Illinois, during its normal business hours. All interested persons are hereby notified that the Tentative Statements of Amended Budget and Appropriation Ordinance for the fiscal year beginning December 1, 2017 and ending November 30, 2018, of the County of Grundy, Illinois is available for public inspection. The Tentative Statements of Amended Budget and Appropriation Ordinance and documentation necessary to support the Ordinance are available at the Grundy County Clerk’s Office, 111 E. Washington Street, Room 12, Courthouse, Morris, Illinois during its normal business hours.